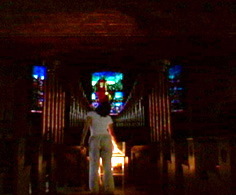 Here’s where it gets really cool: the Mocean creators hooked up the water tank to a pipe organ (video included). The impact of the water interface on the harmonic content of the organ is simply sublime. I could go on, but go check it out for yourself! (Setup: MIDI organ + Jitter software.) Liubo tells us Mocean 3 will be “bigger and badder” and “almost a bathtub.” Can’t wait. If you can get to Vancouver at the end of May, you can check out Mocean and other innovative new instruments at a conference dedicated to the subject. If you’re interested in doing this sort of thing yourself, one of the professors at NYU (at which the Mocean team is based) has a terrific book called Physical Computing . There are great Web resources, too, but having it all in a book is worthwhile — definitely on my bookshelf.